DO YOU NEED AN AIR TESTING SPECIALIST? Northern Air Tightness Testing carry out air testing in Yorkshire and beyond. Our blogs are there to inform and help you when planning your new build and help you prepare for air test day. Whether you choose to use us for the test or not please feel free to have a look at our blogs, we hope you find them informative and helpful. Following an email request from a building surveyor we were commissioned to carry out an Air Pressure Test of a office building in Leeds. The building was built over 12 years ago so at the time did not require an air test. However, the purpose of the test was to identify any areas of air leakage, as there were concerns about the building struggling to stay warm. The air test was subsequently carried out on 23rd December 2015. The method used to establish the ‘air tightness’ of the building is to use air moving equipment to establish air pressure differences between the inside and outside of the building. 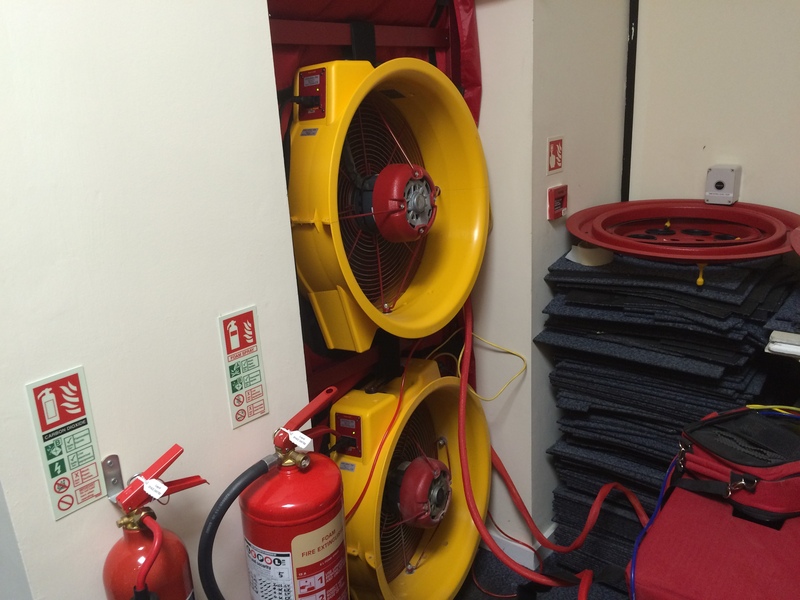 In this case the building was de-pressurised to allow us to identify air leaking into the building. Under existing Building Regulations it is desirable to achieve an air pressure ‘score’ of below 10m3/m2/h. That is to say that under test conditions there would be less than 10 cubic meters of air escaping through each square meter of the building envelope per hour. However, the specific score required may be less than ten depending on design energy requirements. As this building was constructed approximately 12 years ago it pre dates the requirements to be air tested to comply with building regulations. On the day of the air test we calculated the building volume and envelope area so that we could obtain an air pressure score to indicate whether air leakage could be the cause of the building failing to stay warm. The result we achieved was 12.14m3/m2/h. Although this is above what would now be required under regulations it is not a particularly bad result for a building pre dating air test requirements. Whilst the building was under test conditions i.e. de-pressurised, we carried out a survey to establish where the weakest areas were and it became apparent that the vast majority of air leakage was from the first floor of the building. Further investigation was carried out which necessitated the removal of some of the ceiling tiles at various points around the perimeter of the offices on the first floor. We found that the air leakage was caused by the fact that the internal skin of the building was not sealed adequately between the wall structure and metal roof. We provided the customer with a video demonstrating air movement in the roof area and a number of photographs illustrating the lack of sealing between the roof and walls. We also made recommendations advising of remedial work and suggestions of additional insulation to the roof space. If you require air testing in Yorkshire or anywhere in the north of England, either fill in your contact details or give us a call. Either way we will let you have our free air test check list to help you prepare. We are an independent company and have been operating since 2009. We are experienced in carrying out air pressure tests for large national house builders and independent self builds alike. We pride ourselves on providing an efficient, reliable and uncomplicated service which is tailored to your requirements.